The original Olivier Award-nominated show, The Rat Pack Live from Las Vegas, is back in the West End for two weeks only, at the Wyndham’s Theatre from Monday January 9 - Saturday January 21. 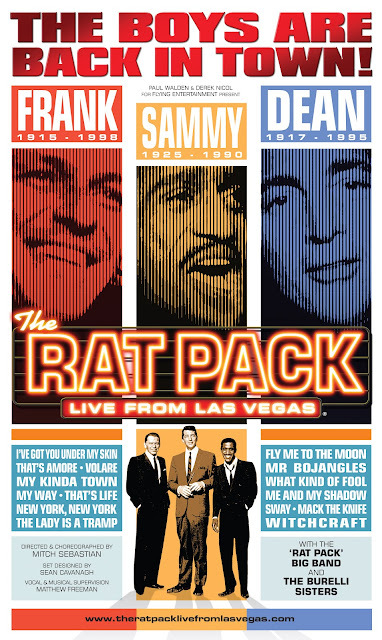 And after numerous critically acclaimed national tours since 2000, and playing at a record-breaking eight West End theatres, The Rat Pack Live From Las Vegas is still the coolest party in town! This spectacular production celebrates the incredible singing talent of three world famous entertainers and performers - Frank Sinatra, Sammy Davis Jnr and Dean Martin -and some of the finest music and song that has ever been recorded. Drift back to a glamorous era where the famous rubbed shoulders with the politicians and partied hard, Frank, Sammy & Dean, all singing, all dancing, all round entertainers, injected not only their songs into the 50s and 60s, but a lifestyle that everyone wanted. Legends of the 20th Century, idols of the music industry, superstars of the movies, Frank, Sammy & Dean are above all renowned worldwide for their talented voices. Their unique contribution to 20th Century popular music is second to none. Frank, Sammy & Dean all received critical acclaim quite late in their careers and it wasn’t until the late 50s and early 60s that they stormed the world and stayed at the top. And their recordings still constantly chart high throughout the world. Now, with a talented cast and the Rat Pack Big Band, take a trip back to the glamorous, hot, glitzy nights of Las Vegas. Experience Frank, Sammy & Dean’s world famous classic recordings and more in this sensationally staged production that brings the music and lives of these legendary characters together again. Among the classic songs you’ll enjoy again are The Lady is a Tramp, Mr Bojangles, I’ve Got You Under My Skin, That’s Amore, Everybody Loves Somebody Sometime, New York, New York, My Kinda Town, Fly Me to the Moon, Sway, That’s Life, Volare, Me And My Shadow, My Way and What Kind of Fool. Stephen Triffitt (Frank Sinatra) is the best known Sinatra performer in the UK. He first came to the public’s attention when he appeared on Star in Their Eyes in May 2000. He won his heat, polling 400,000 votes - and a new career was born! Soon after Stephen flew to Atlantic City to star as Frank in a show called The Main Event. He returned from the States in June 2002, once again starring in The Main Event, this time for a three-month run, headlining at The Venetian on the Strip in Las Vegas, which was built on the site of the Sands Hotel. Stephen then embarked on a UK national tour of The Rat Pack Live From Las Vegas. This led him to star in the West End, where the show was nominated for an Olivier Award, and ran for more than 1,000 performances. Mark Adams (Dean Martin) was also part of the Olivier-nominated West End cast of The Rat Pack Live From Las Vegas. He was then invited to Canada to open the show in its North American premiere at the Canon Theatre in Toronto. He has toured the UK with his own show That’s Amore!, a celebration of Dean Martin based on Dean’s successful US TV variety show that ran for over 10 years. Giles Terera (Sammy Davis Jr) previously played Sammy in The Rat Pack Live From Las Vegas at the Strand Theatre and Adelphi Theatre. He also appeared in the West End productions of Avenue Q, Jailhouse Rock, 125th Street, and Rent. Director & Choreographer Mitch Sebastian. Vocal and Music Supervisor Matthew Freeman. Produced by Paul Walden and Derek Nicol for Flying Entertainment Ltd.